You are urged to pass-along this publication to your friends, if you like it, and if you think they may enjoy it. If you received this from a friend and if you like what you read, please Subscribe free of charge and you will also receive a bonus book on Practical HARDNESS TESTING Made Simple. The addresses reported hereafter were live and correct at the time of their publication. If they are long they may be displayed in two or more lines. In that case one has to care that the URL be copied completely in a single line without any space, and Enter. If the information is important to you as we hope, you may save the selected pages in a suitable folder on your Computer for easy reference. You are welcome to forward this page to those of your friends who may profit of this information. The coming Autumn brings this 158th new issue of Practical Welding Letter with some information on arguments likely to be of some interest at least to some of our readers. We start (2) with a reminder of what was a big breakthrough some years ago when a new method of creating new metallic alloys was devised, which held promise to provide a way to produce new metallic alloys capable of exceptional mechanical properties. We are talking of High Entropy Alloys. The promise is still there, but after much research it appears that there is not yet a simple method whereby the required characteristics could be established beforehand and then suitable materials developed. Notwithstanding deeper understanding, the field to be explored is still too vast to find one's way in it, and much trial and error is needed just to obtain encouraging results. But the search goes on as the prize is too valuable, even if it will take time to obtain it. Then (3) we touch the theme of spatter, a curse afflicting many shops. An article reported here briefly summarizes how different equipment providers attacked the problem by their own means. The list makes clear that there may be various solutions, but finding the best one for a given case may be difficult, as each supplier tends to promote their specific equipment. If possible, testing should give the ultimate answer. Ferrite Number (4) may still be a mystery for some, but specific code requirements may oblige to tackle the issue. Answers to other's question may help to clarify the matter, especially if given by a world expert. In this case those dealing with this issue are invited to see the original article. For those needing to improve deposition rate and productivity while limiting heat input, the research reported (7) might be worth of follow up. If there is merit in the conclusions, the solution proposed will likely be adopted by one of the equipment suppliers and be available, in due time, in the market. The Pages of this Month (8) do not to fit with welding, the main theme of our website. But I hope I will be excused for using my pages as a vehicle to let my ideas be known around. In these page I show a new way of building Composite Dies for Forging and Forming, likely to have some advantages, hopefully, at least in certain cases. Your comments are welcome. And then we report (11) on an article that foresees important changes likely to affect deeply the known ways of the past. Rethinking and reorganizing may become a necessity, just to stay afloat. By not preparing for coming dangers one risks the worst. Even if not deciding to ask for external help one should examine attentively if any one of the suggested items should be taken seriously into account. The other columns appear at their usual place. Your experience may have taught you something interesting to your fellow readers: we would be pleased to publish your notes. Let us know what you think, and contribute your notes. Your feedback is welcome. Please use the Contact Us Form. This subject was introduced in PWL#140 - April 2015, more than a year and a half ago, as the big promise of metallurgical innovation, likely to introduce soon new materials exhibiting exceptional mechanical properties capable of unheard of performance in all kinds of demanding applications. Now however, while much research work has be done and better understanding has been achieved, we are still awaiting the appearance of those materials whose promise is still looming some time in the future. 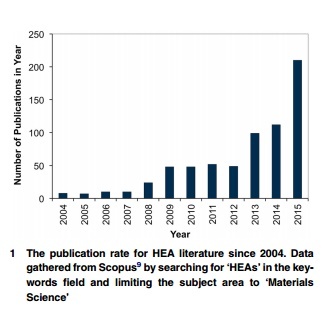 The article summarized hereafter, providing a critical review of research work performed over recent years, still affirms that "Their use as structural materials is one of the most promising and exciting opportunities", referring to new High Entropy Alloys. The introduction reminds that those are compositionally very different from classical engineering alloys, as they contain multiple principal alloying elements in near equi-atomic ratios. that properties are derived from a cocktail effect. By assessing these claims on the basis of existing experimental evidence in the literature, as well as classical metallurgical understanding, the article challenges the validity of the above assumptions and concludes that the significance of these effects may not be as great as initially believed. The critical assessment of the first of the core effects above reveals that in many of the alloys studied the phase stability is much weaker than originally believed. In fact, excluding a few very specific compositions, the majority of the other HEAs investigated have been found to decompose into more than one solid phase given the correct heat treatment. The article therefore concludes that there is limited evidence to suggest that entropic stabilization has an overarching effect on the microstructural stability of HEAs. "In the rare cases that HEAs have been found to be stable as a single solid- solution phase, it is not the effect of high configurational entropy that leads to their stability. Rather, it seems that the enthalpy term associated with solution separation or intermetallic formation has not been significant in these cases. The influence of enthalpy, not entropy, is predominant". At this point the article embarks in a discussion about the naming of these alloys as a group, recommending further work to establish a systematic convention for calling different HEAs classes by specific attributes. Concerning the second point, on severely distorted lattices, the article reminds that the introduction of substitutional solute atoms into a solvent matrix causes the displacement of neighboring atoms from their ideal lattice positions, generating a strain field whose interactions with dislocation movement result in solid-solution strengthening. However in certain studies it appears that the strengthening effect of precipitates may have been overlooked. The article concludes that this topic requires further investigation. On the third core effect, namely sluggish diffusion kinetics, the article observes that there is a great deal of experimental evidence that implies that atomic movement in HEAs is not unusually sluggish, as confirmed by observations of precipitation in many as-cast HEA samples, including those subjected to very rapid cooling, and it concludes that "in summary, the evidence considered here suggests that atomic diffusion in HEAs is unlikely to be anomalously slow, and that it is certainly not so in a generalized sense across all HEAs". Finally the article dismisses the last core effect, as rules of mixtures, permitting to explain special properties, applies also to conventional alloys. The article advocates a search to the route for alloy development for structural applications, because of the enormous range of possible HEA alloy compositions, and provides several examples where phase prediction was based on parametric studies, but it advises that there are some significant limitations. The concluding remarks include the following understanding: "HEAs have thrust us out of an age of limitation, where alloys were designed around one principal element, and into a new world of seemingly endless possibility. However, careful and educated alloying is required, such that we focus our attention on key features of the compositional landscape presented by HEAs, rather than wander somewhat aimlessly in its limitless expanse." From International Materials Reviews 2016 VOL 61 NO 3. A comprehensive article by TWI throws light on the means that different equipment suppliers developed in recent times to control and reduce spatter generation. 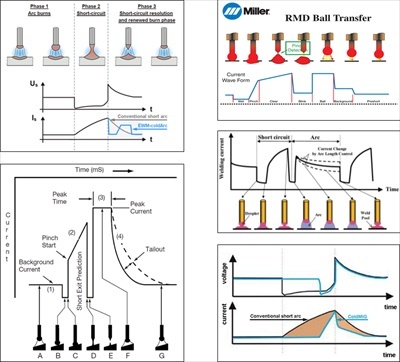 The article analyzes the different forms of metal transfer and provides graphs indicating the change of voltage and current during the various phases of material detachment from the electrode. It goes on explaining the need of finer control in order to improve the quality of the weld and the efficiency of the process. Different solutions are proposed by different manufacturers, all intending to improve control and stability of current profile, aiming at reducing spatter generation and enhancing heat input control. No indication is given as to which solution is to be preferred in which circumstances. This leaves users with an overchoice, very much dependent on the persuasion arts of equipment sale agents. Only by using in practice different systems and comparing their performances in applications typical to the shop, can one establish preferences with some confidence of having done the best selection for the jobs at hand. Interested reader are urged to see the original article indicated above, and to prepare the critical questions they should ask suppliers to meet their purposes and solve their problems. Waveforms produced from different Power Sources. Clockwise from top-left: EWM ColdArc, Miller RMD, Daihen CBT, Merkle ColdMIG and Lincoln STT. Measured ferrite content in austenitic stainless steel GMA weld metal from metal cored electrode EC308L was found much higher than the calculated ferrite content. The same was not found when using solid metal electrode ER308L. Answering to the question on the reasons for the difference, our preferred mentor Damian J. Kotecki writes at page 50 in the September 2016 issue of the Welding Journal that measurements made with a calibrated instrument should take precedence over predictions, however diligently calculated. The Author advises that there is a fundamental difference in the Nitrogen content in the two types of filler metal: while in the solid rod N is assumed as 0.08%, in the metal cored wire it is more likely 0.02%. The difference stems from the different processing of the solid wire, from stainless material, vs. the metal core one, where all the alloying elements are present in the filling. Just by taking nominally identical materials, having different nitrogen contents as assumed above, brings about the different calculated contents as appearing in the reported diagram, and as reported by the inquirer. Better results could have been obtained by using actual nitrogen content. As usually, the article summarized above is highly instructive. It is strongly recommended to all readers needing Ferrite Number measured or predicted. Overwelding is welding made in excess of what is required for sustaining the applied stresses. It results from inaccurate cutting and fitting, poor supervision, insufficient training or lack of confidence in the strength of the weld as specified. It results in unforeseen, useless costs. Projection Welding is a resistance welding process where the heat is produced by resistance to the flow of electric current between two electrodes pressing on the elements to be welded. The resulting weld nuggets are localized at predetermined points by projections, embossments or intersections. Runoff Weld Tab is an additional plate, placed beyond the end of the joint, on which the weld is terminated. Stringer Bead is a weld bead deposited along a straight line travel without weaving. Transferred Arc is an electric arc struck between the electrode of the torch and the workpiece. Underfill is a groove weld condition in which the weld face or root face is below the adjacent surface of the base metal. V-groove weld is a type of groove weld performed on base metal where a V-groove was machined. Wormhole porosity is a nonstandard term when used for piping porosity, which is a form of porosity with length greater than its width that lies approximately perpendicular to the weld face. 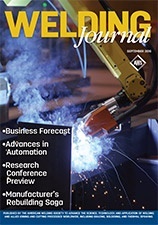 A research article published at page 340-s in the Welding Research supplement of the September 2016 Issue of the Welding Journal starts with the observation that regular Gas Metal Arc Welding (GMAW), the most widely used welding process, has an inherent weak point. It consists in the fact that when one wants to increase deposition rate, one increases also the heat input. In the search for higher productivity this is seldom desirable. The researchers tried to build a new welding process that would decouple the effects by separating the molten filler metal supply from the arc employed to heat the workpiece. 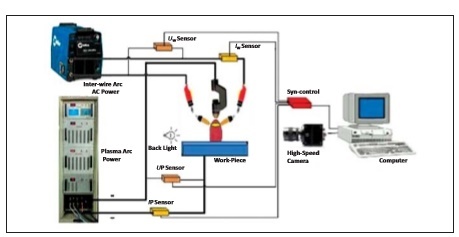 By using an indirect arc between two filler metals in close position fed by an alternating current power supply, while the workpiece is not connected to the power source, heat input is minimized but is also non controllable. The article makes reference to a similar process using also a GTAW electrode to form a bypass arc, melting a wire supplied independently from that of the GMAW, providing improvements in quality and productivity. In the present study, the GTAW process that was previously used was substituted by a plasma arc (PAW), while a cross-arc is established between two GMAW wires made to advance one toward the other with separate speed control, and the heat input into the workpiece is controlled by the Plasma Arc. The Plasma arc force is essential to detach the droplets from the wires. The larger the pulse duration and the larger the plasma gas flow the greater the force on the droplets and the smoother the metal transfer. While this new method seems still far from being easily introduced in the typical welding shop, the process may be worth of attentive follow-up especially for the cases where productivity improvement is needed without unduly increasing heat input in the workpiece. The pages of this Month are a surprise, in that they don't deal with subjects related to welding, the main theme of this website. For a number of reasons the author, after coming up with new ideas relative to methods for building forging or forming dies, decided to publish them in this place to make them available to a larger public. It is expected that our readers are not so narrow minded to refuse to look at something outside of the principal interests of this publication. Comments and feedback on these pages are welcome. Please use the Contact Us Form. 9.1 - Mill Scale is the heavy oxide layer that forms during the hot fabrication or heat treatment of metals. 9.2 - Necking is the reduction of the cross-sectional area of a material in a localized area by uniaxial tension or by stretching. Also the reduction of the diameter of a portion of the length of a cylindrical shell or tube. 9.3 - Overdraft is a condition wherein a metal curves upward on leaving the rolls because of the higher speed of the lower roll. 9.4 - Passivity is a condition in which a piece of metal, because of an impervious covering of oxide or other compound, has a potential much more positive than that of the metal in the active state. 9.5 - Ratcheting is the progressive cyclic inelastic deformation (growth, for example) that occurs when a component or structure is subjected to a cyclic secondary stress superimposed on a sustained primary stress. The process is called thermal ratcheting when cyclic strain is induced by cyclic changes in temperature, and isothermal ratcheting when cyclic strain is mechanical in origin (even though accompanied by cyclic changes in temperature). 9.6 - Sand is a granular material naturally or artificially produced by the disintegration or crushing of rocks or mineral deposits. In casting, the term denotes an aggregate, with an individual particle (grain) size of 0.06 to 2 mm (0.002 to 0.08 in.) in diameter, that is largely free of finer constituents, such as silt and clay, which are often present in natural sand deposits. The most commonly used foundry sand is silica; however, zircon, olivine, aluminum silicates, and other crushed ceramics are used for special applications. Make sure the delivery of your PWL is not interrupted. Can a Supercomputer Suggest the Best Cancer Treatment? The Fabricator's new issue runs an article that asks some tough questions. But instead of discussing the problems and suggesting how to analyze them, after listing them, it refers the readers to a specialized firm whose job is to help industries grow. Nevertheless people active in their fields may realize that massive change is bound to occur, and that the best chances to survive and succeed are to adapt to the changes, as Darwin explained a long time ago. As problems become too hard to solve them alone, it may be a good idea to look for help, either by joining forces with alike people or by studying with external advice how to restructure activities. In the most difficult cases the last resort may be to find out how to quit before it is too late. The article indicated hereafter has a link sending to a program highlighting some of the issues in general terms. The consulting firm quoted, or other ones, capable of helping industry reorganize, may indeed suggest the general framework into which one should move. But it is essential that the hard choices on selection of items to be produced by which machines and methods will be made by those most adapted to take decisions and introduce innovations in their own activity. Readers facing these and similar difficulties are invited to share how they plan to confront them. There is nothing you or your publication did or didn't do that lead to this [unsubscription]. I am just cleaning up what arrives in my inbox at work. I had gotten advice from you a number of years back when I needed, and I am grateful. I have been out of the welding "field" for a few years now, so unfortunately this is just one of the type of e-mails that no longer gets looked at or read. If I ever do get back in the field, I know of your existence and knowledge base. Therefore, I would not hesitate to re-subscribe and/or directly ask questions. I will also continue to refer you to weldors I know (new or experienced) that may have questions. The fact that students ask immature questions is not surprising. They still don't know what they need. But it often appears that they did not make any effort to understand their problem. In that case I simply refer them to browsing our website, asking them to come back with clearer queries. But it is quite amazing that inquirers already deeply involved with welding ask their question after the fact. As an example, a recent query was related to an order of welded items from abroad. "Is there any way that we can ask them to test that the welding is strong?" It should have been obvious that any quality requirements should have been spelled out at the time of ordering. How can purchasing agents fail to think so? How can one help them usefully when it is too late? & 9th International Welding Symposium of Japan Welding Society. 14.2 - 28th National Robot Safety Conference 2016. 14.4 - ASNT Annual Conference 2016. Back to Past Issues of PWL.